The windchills impacting the Midwest on Wednesday morning. A deadly and likely once-in-a-lifetime arctic deep freeze from the polar vortex settled in over the Midwest on Wednesday, shuttering schools and causing the U.S. Postal Service to suspend mail delivery in areas as forecasters warned people to keep their mouths closed if stepping out. Wind chills of negative 54 degrees Fahreneit were reported in International Falls, Minnesota and minus 52 degrees in Minneapolis on Wednesday morning while Des Moines, Iowa reported a bitterly cold wind chill of minus 42 degrees and the aptly-named “Windy City” of Chicago had a wind chill of negative 52 degrees just before sunrise. The cold snap also is causing travel disruptions throughout the region. United Airlines canceled about 500 flights at Chicago’s O’Hare International Airport from Tuesday through Thursday, while Southwest Airlines canceled more than 700 flights at Midway International Airport in the same time period. Amtrak also canceled all trains out of Chicago on Wednesday and into Thursday. The temperatures across the Midwest on Wednesday were colder than the likes of Greenland and Alaska. The temperatures in the Midwest were colder than at the McMurdo Station, the main U.S. station in Antarctica, where it was a balmy 23 degrees on Wednesday. A wind chill of minus 25 degrees can freeze skin within 15 minutes, according to the National Weather Service. 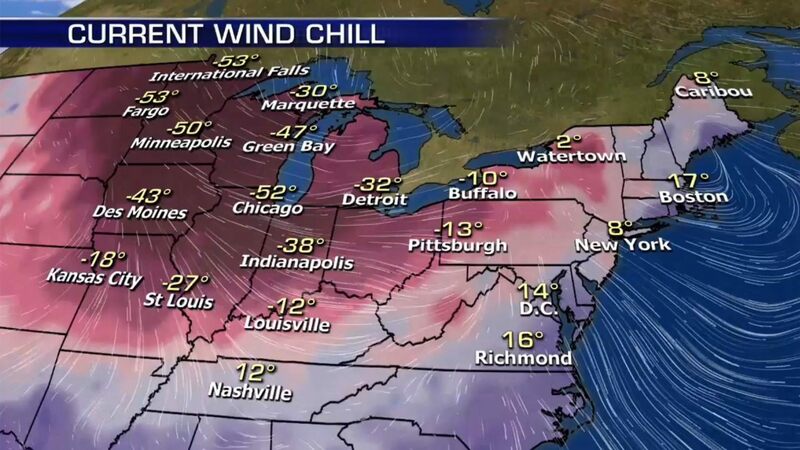 Given it’s -22° in Chicago early this a.m., we wondered how this cold stacked up with other North American cities. There are many cities in the heart of the continent today where it is necessary to dress as warm as possible if outside. Chicago is one of those! “You really can’t be outside for longer than minutes because your face will freeze in these type of temperatures,” she added. The bitter blast blanketing the Midwest has already taken a deadly turn after a 55-year-old man was found frozen in a garage in Wisconsin on Tuesday. The Milwaukee County Medical Examiner’s Office told FOX6 that Charley Lampley collapsed and died after shoveling snow at his home in Milwaukee. Lampley was found frozen in a detached garage near a snow shovel and had appeared to have had been outside overnight. The garage door was open, and the medical examiner noted Lampley was fully clothed and dressed for the weather. The preliminary manner of death was ruled “natural,” according to FOX6. Forecasters in Iowa took the extra step of emphasizing how cold conditions will be to hearty Midwesterners by telling people something blunt: keep your mouths shut outdoors. “These are record-breaking cold air temperatures, with wind chill values not seen in the 21st century in Iowa,” the agency said. Forecasters told people planning on going outside to make sure they cover any exposed skin and make sure they have supplies in their cars. EMERGENCY DECLARATIONS, SHELTERING IN PLACE. Governors in Illinois, Wisconsin and Michigan declared emergencies as the worst of the cold threatened on Wednesday, as hundreds of public schools and several large universities from North Dakota to Pennsylvania canceled classes.